When my husband leaves my eyesight, my breath catches. It catches from a year of sitting and waiting and wondering. It catches because once we were speaking and a commotion broke out in the background and he yelled, “I have to go” before the line went dead. It catches because I sat and waiting for three days before hearing that he was ok. There are things that you can’t undo in your life. 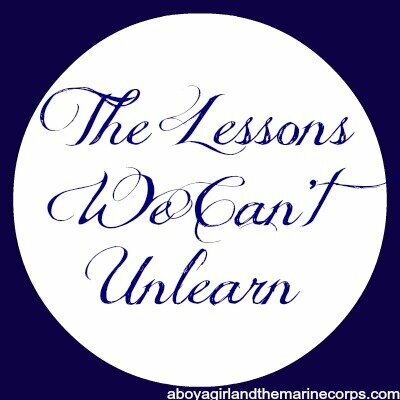 There are lessons you can’t unlearn and habits you can’t break no matter how hard you try. My habit, my lesson, is that he is never guaranteed to be safe, no matter where he is. And I can never be sure he is alive, unless I am physically talking to him or able to see him. And so I sit at home, my breath stuck in my chest, until he returns again. He admits that he doesn’t understand. He admits that what we spouses live through on the other side is something he doesn’t understand. He once asked how I did it. He once asked how I spent a year, unsure of whether or not he was alive, sitting and waiting for three days to hear from him. And I told him the truth: I have no idea. I just did. We just do. There are many who don’t understand the life we live during deployments. The very idea of being separated from their spouse for that length of time is unfathomable. There are those who are not sure if they could cope with the stress, the worry and the fear. I think everyone would be surprised by what they can do when they have no choice. Or when life must move on, regardless of how you feel. I married A Boy because I love him. This life was just part of that. It wasn’t something I understood. It wasn’t something I desperately wished for, I simply married someone and this happened to be the life we built because he is a Marine. Deployments can make or break you. You have to choose to wake up each day and live, no matter what. Some days, it was all I could do to get out of bed and make it to class on time. Others, I was lucky to put on clean pajamas. But everyday, I had to accept that my world kept turning, that finals would still happen this week, groceries still had to be bought. And yet, of all the things I did to cope, of all the things I learned, I have never been able break the habit of my breath catching when I can’t see my husband. He’s been home for three years now. Three years of intense and unnecessary worry for a man who is more than capable of getting the mail without my help. But I can’t help but peak out the window and wonder if he will come back. I still dream of the night he shouted into the phone before the line went dead. I dream that I can’t find him. I dream that I am trying to call his name, but nothing will come out. And I wake to wonder if he really came home at all. This entry was posted in Deployment, Military Life and tagged deployment, marine corps, military, military life, military spouse by A Girl. Bookmark the permalink.